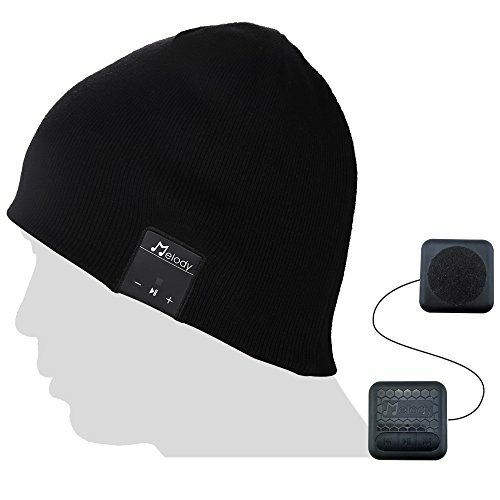 SOFT & COMFORTABLE FABRIC: The wireless Bluetooth Music beanie made of 45% Cotton +55% Acrylic double fabric music hat for warmth. Simple yet stylish. The total weight is 4.9 ounces, together with the earphone. You will feel nothing for a long wear . Extremely comfortable, Comfort, warmth, and breathability make this hat an essential part of your outdoor gear. FULLY WASHBLE & EASY OPERATION: Easy to remove and re-install Bluetooth headset speaker driver from the wireless bluetooth beanie hat for washing . Don't worry pilling and shrunk. Easy to control the operate panel , With microphone and volume buttons, the headphones enable you to make hands-free calls and manage music easily and instantly. HIGH COMPATIBILITY WITH MUSIC: The bluetooth cap with newest headphones, Not only for iPhone, also it can work with all smartphones, tablets, and music players for up to 6-8 hours of talk/music time and 175 hours on standby. Allow automatically reconnecting if paired successfully before . Bluetooth range up to 33 feet. MORE STABLE CONNECTIVITY & SIGNAL: Easy to connect pairs with the built in ceramic antenna, and this Bluetooth headphones utilizes CVC 6.0 Noise Cancelling Mic to reduce outside noises and further enable clearer microphone sound. You'll find it most convenient to carry the earphones around for any outdoor activities, such as hiking, cycling, sports, exercise and more. 18 Month Warranty: Wearing comfort to match your active lifestyle like running, jogging, cycling, driving, camping, hiking gym exercise and other outdoor sports. You will find it is comfy and quite practical.The warranty is 18 month,100% risk free to purchase ,So what do you wait for?